So I was warned by my friendly neighborhood Pop Culture Historian that this movie was not going to be that great, but I choose to be skeptical whenever I hear bad reviews about animated films because I’ve learned from experience that I tend to feel the opposite from the general consensus. For example, from what I hear, most people enjoyed Wreck-It Ralph (2012). Me? Not so much. Anyway, in this case, I admit that I probably should have listened. For some reason, I felt like the trailers promised me so much more than I feel I actually received. In my opinion, I thought the story was a tad disorganized and I didn’t find myself able to invest in any of the characters. Part of the problem, I think, was the lack of character development. Even the villain didn’t seem to have a lot of depth to him. I was also definitely disappointed by the ending. The greatest let-down for me though, would probably have to be the love story bits. I found the “main” love story to not only be uninteresting, I also didn’t like the Escaflowne (1996) TV series-like ending. People who have watched that Japanese animated series might have an idea what I mean by that. 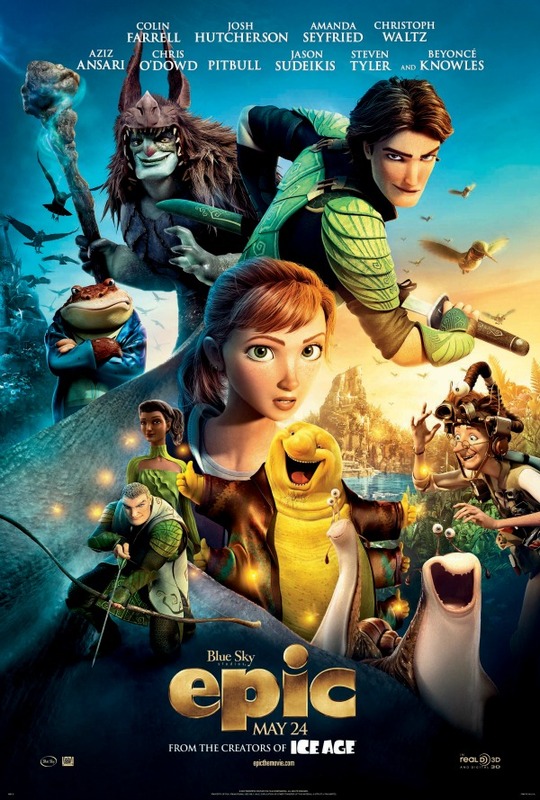 I had more interest in the “minor” love story between the characters voiced by Beyonce and Colin Farrell, but of course that’s the one that gets cut off rather quickly, and after that I rapidly lost interest in this movie. Kids might like it; I personally wasn’t all that entertained, and was very ready to leave the theater well before the movie hit its second half. I wish I had used one of my free movie vouchers on this. Anyway, I’m glad I got this entry out, as it’s been sitting in my queue for the longest—about a good 2 1/2 months now. Next up should be Despicable Me 2, which I did think was more hilarious than the first, but at the same time I can’t say I’d willingly sit through it again a second time. If anything though, it’s worth watching just for the ending number sung by the Minions in their Minionese. I’m surprised that you actually liked this movie even less than I did! I feel like many other movies of its ilk, it basically said, “Come out and see it because ALL your favorite actors provide voices!” I think it’s for that reason my chief complaint arose, which was the fact that it had WAY more characters than it could handle in its runtime. Christoph Waltz’s character was WOEFULLY underused. Ouch, I am glad I passed on checking this one out. Yeah, haha, I wasn’t all that entertained.